Ever since Google acquired Fabric, we've known integration with Firebase was in the cards. That day has come, or at least it's pretty close. Firebase will be rolling out an update to new and existing users that adds access to Crashlytics data from inside the console. Managers and developers will be able to examine crash reports, analytics, and other pieces of data without jumping between two separate sites. Integration also brings new capabilities, starting with the ability to trigger Cloud Functions in response to Crashlytics events. This can be used to automate tasks in response to crash reports and other types of activity to suit your workflow and improve efficiency. Crashlytics integration will be coming to all accounts over the next few weeks, but you can jump the line by signing up at https://g.co/firebase/opt-in. Along with Crashlytics access, the whole Firebase console is getting a makeover. The interface has been redesigned with four main categories: Develop, Stability, Analytics, and Grow. Each category focuses on different parts of the lifecycle and contains the tools that make sense for different members of the team. The landing page contains data points that most teams are looking for when they open the console: Daily active users, monthly active users, crash-free user rate, and total crashes. Sparkline graphs show at a glance how your numbers are changing. An overhauled Analytics page has a new dashboard focused on displaying tasks to be addressed and includes a new Latest Release section with details about adoption rates and stability. The cards update in realtime, so the page can be left open while it stays up to date. These updates to the console are also part of the Crashlytics integration, so they will be rolling out to everybody over the next few weeks, or they can be turned on by signing up at https://g.co/firebase/opt-in. Many of Google's apps use A/B testing to experiment with different interface options and features. This isn't a particularly hard thing to do, but it does require a server and an infrastructure for managing different groups of testers and tracking data. 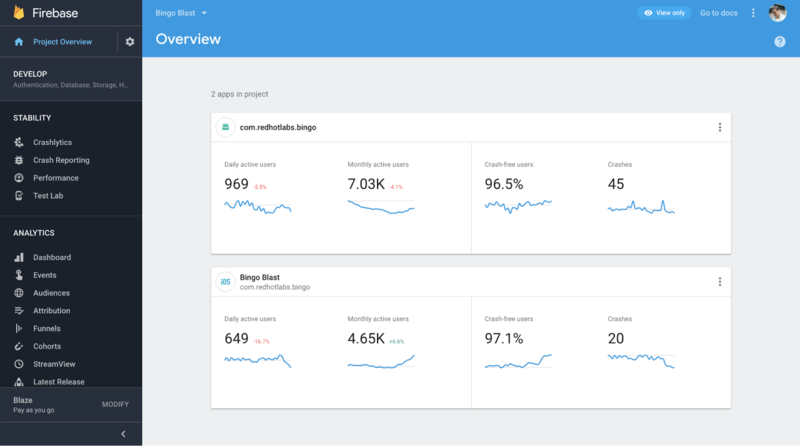 Firebase is launching a new framework to handle all of the intricacies of A/B testing for developers. Based on Google Optimize, the A/B testing framework is integrated into Analytics, Firebase Cloud Messaging, and Remote Config to easily create test groups and track results. The framework is launching today in beta. Details for implementing it can be found here. The hot topic of the year is machine learning, and Google is leading the way. 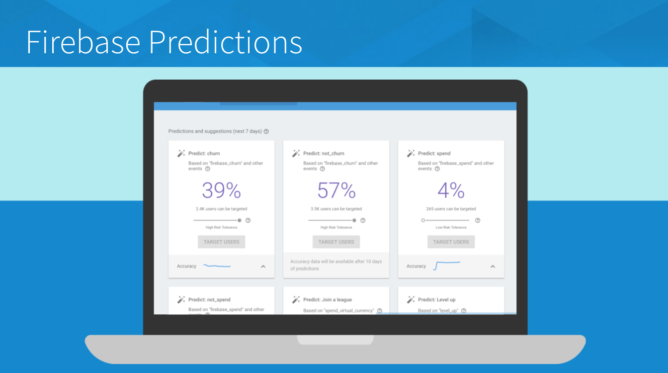 Firebase is putting that technology to work with another new product called Predictions. Predictions will take into account details and common trends in behavior to evaluate which users are likely to churn and which will stick with an app, and it will attempt to pick the users that are likely to spend money versus those that aren't. Similar prediction capabilities have been made available in the Play Games API previously. Firebase has been testing Predictions with a number of partners and is making it available as a beta today. There is also an update to the Cloud Messaging API that makes it easier to use for cross-platform notifications. Finally, Firebase is inviting users to sign up to an alpha program to be the first to test new features before they launch. If you would like to get more details, check out the official blog post and head over to the Firebase channel on YouTube to watch sessions from the developer summit in Amsterdam.